It imports and exports several file formats, including DXF and optimized 3DMF. It can also be used to produce VRML for the web, models for POV-Ray, sprites, models for OpenGL applications, and more. 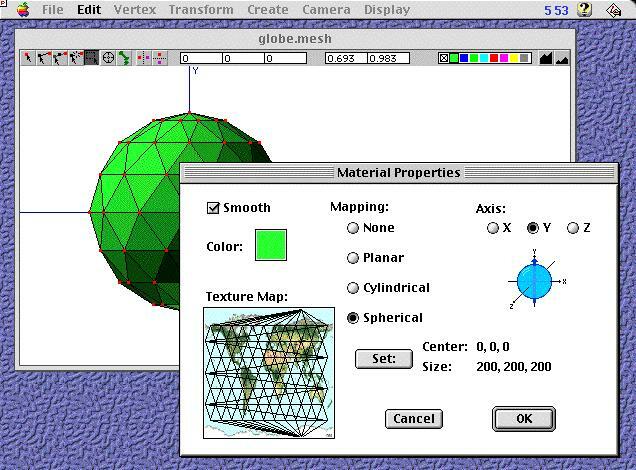 Note: some Meshwork functionality requires an external library: Quesa for the standard version, or QuickDraw 3D for the Classic version. These are both freely available, and it is highly recommended that you install the appropriate one to get the most out of Meshwork. The Meshwork Manual is available both here (online) and via the links above. It includes introductory material, topics in depth, a reference section and a tutorial. The documentation download also includes sample files. There is also a tutorial on pinned-mode texture mapping by Jeff Quan. Another excellent tutorial (also by Jeff Quan!) explains how alpha masks work in Meshwork/Quesa/QD3D. The Undo command is having serious problems. Avoid it for now; I'll be reworking the underlying code over the next several releases. You currently can't safely have more than four Poses windows open at once. This is an ugly technical limitation which I expect to remove soon. Texture mapping may not work correctly with POV-Ray export of posed models. This is because POV-Ray does not (easily) support vertex-level texture mapping, without which keeping the texture in place on a deformed mesh is impossible. This problem only affects POV-Ray export with texture mapping on a posed model -- all other combinations works just fine. Under Mac OS 8.0 and 8.1, the Poses window will crash Meshwork. I can only support MacOS 8.6 and higher. Meshwork may quit abruptly when it runs out of memory. It won't crash your computer, but you will lose any work in Meshwork you haven't saved. This typically happens when attempting to open or import a very large model. As a work-around, allocate more memory to Meshwork, or use smaller models. REALbasic developers will find that the 3DMF files generated by Meshwork operate very well with the 3D technology built into REALbasic. Meshwork's DXF files can be read by Render-Boy, a great interactive ray-tracing program. Check it out if you haven't yet -- it's a lot of fun! If you play Avara, you can use Meshwork and DXF import/export to create new game objects (see the Level Design Guide for details). As of 1.6.1, Meshwork supports full color in Avara models! The cool new TACS (20th Century Air Combat Simulator) game allows you to import Meshwork models to replace the default biplanes.